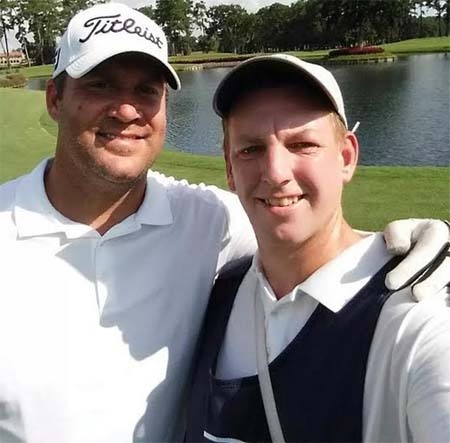 While in Florida last Friday for the pre-season game against the Jacksonville Jaguars, Big Ben and his O.C., Todd Haley got up early and headed out to play a round of golf together at the beautiful TPC Sawgrass course in Ponte Vedra Beach, just outside of Jacksonville. Ben was great. Super, super nice and a really good golfer. It was great having him at Sawgrass. Hopefully he has a chance to come back when he has more time to enjoy the round and the experience. And for the golfers in Steeler Nation: Ben reached the island green 17th hole and made par, barely missing the birdie putt. Coach Haley birdied 17, the most famous hole in golf. Now there’s the old saying about ‘never beating your boss on the golf course’, but if there was one hole that Coach would have liked to beat Ben on, it would have had to be the 17th at TPC Sawgrass. Being a lifelong Steeler fan I’m slightly biased – but it was an honor and pleasure caddying for Ben….and I don’t know if he wants it, but I do have his scorecard, lol. — Jim Goggins. Jim also wanted me to add that the two had “plenty of time to play the course and get back for the team meeting”!! *Thank you for sharing your photo and your story with us, Jim!